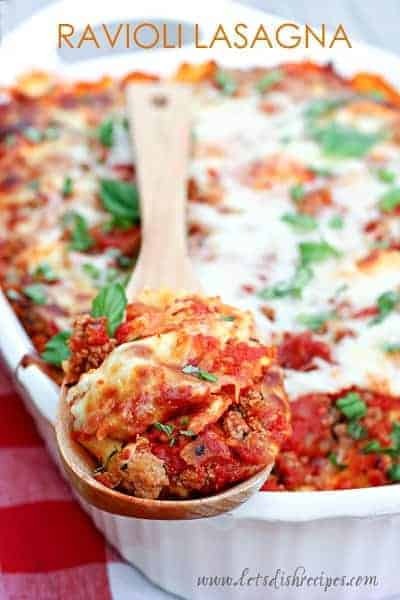 CHEESY RAVIOLI LASAGNA — Layers of ravioli, marinara sauce and cheese combine in this easy, lasagna-style dish the whole family will love! 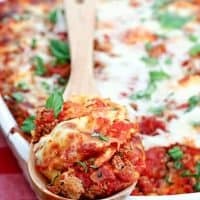 I love a good lasagna, but they can be pretty time consuming to make. Which is why I love this Cheesy Ravioli Lasagna so very much! It’s a snap to put together and my whole family loves it. This non-traditional lasagna has all the flavors of the classic Italian dish, without all the work. And it seems I can’t go wrong when I serve my family ravioli in any way, shape or form! Because who doesn’t love pasta stuffed with cheese? 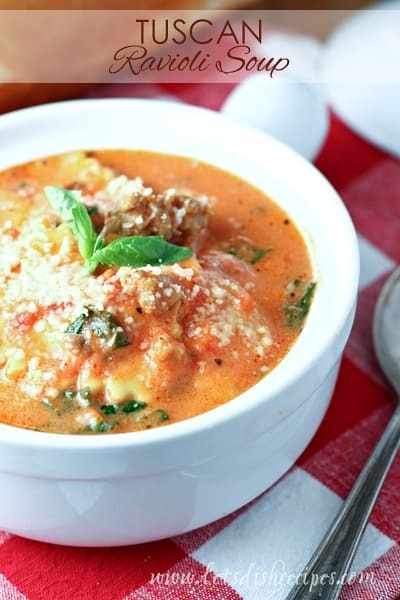 I actually keep some ravioli in my freezer for recipes like this one. I really like to use ground turkey in this recipe. I prefer the texture to ground beef or sausage, and my family can’t tell the difference. Not to mention, it’s a bit healthier–not that it matters too much with all the cheese in this recipe. I just season it up with some Italian herbs and spices and it’s perfect in this dish. You could do the same thing with ground beef, or even Italian sausage (although you may not need as much seasoning if you go with the sausage option). I haven’t tried it myself, but I suspect you could even sneak in some vegetables. That’s what’s so great about this dish! 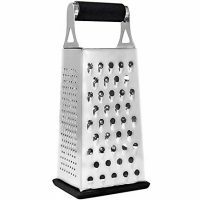 It’s easily adapted to suit your family’s tastes. It’s definitely one to keep in the recipe box for those busy weeknights when you need something that’s quick and easy to prepare. I hope you love this quick and easy weeknight meal as much as my family does! 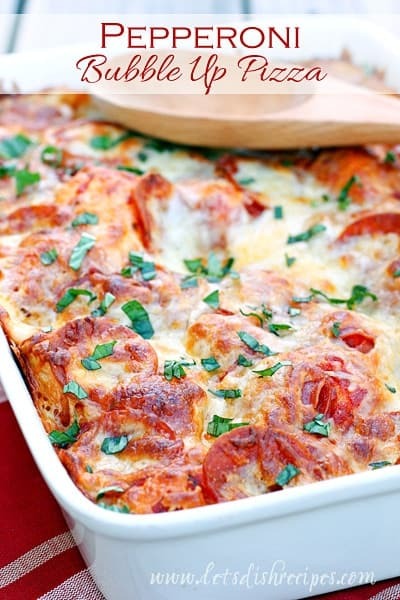 Be sure to save this Cheesy Ravioli Lasagna recipe to your favorite Pinterest board for later. Heat oven to 375 degrees. 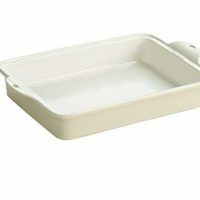 Spray a 9x13 inch baking dish with non-stick cooking spray. 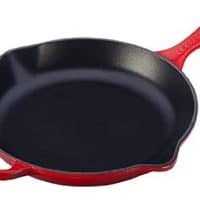 In a large skillet, heat oil over medium-high heat. Add onion and garlic to the skillet and cook until tender, about 2 minutes. Add turkey, along with all of the seasonings, and cook until meat is cooked through and no longer pink. 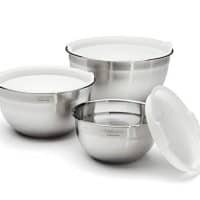 In a large bowl, stir together pasta sauce and water. Spread about 1 1/2 cups of sauce over the bottom of the prepared baking dish. Spread one package of ravioli in an even layer over the sauce. Top with half of the turkey mixture, half of the remaining pasta sauce, half of the mozzarella, all of the Parmesan cheese and half of the basil. Repeat using the remaining ravioli, turkey, sauce and mozzarella cheese. Reserve the remaining basil. Cover and bake for 35-40 minutes. Uncover and bake about 15 minutes more, or until the cheese is melted and golden and the sauce is bubbly. Remove from oven and garnish with the remaining basil before serving. Hi Danelle, My husband Bob just looked at all the recipe pictures, as I was reading off the ingredients list. He said “Those look soooo good, you tell that woman that we are coming over to her house for dinner!! !” ha ha! Then he said, “Now look what she did, those pictures looked so good, I drooled all over my tee shirt and NOW I have to go and put on a clean one!!! ha ha!!!!! Really, he loved everyone of them and we wish we could get up and make all of them, right now!!!!! Anyway, thought you would get a kick out of his funny way of describing your great recipes! That is great! Made my day! 🙂 Thank you.